Kwun Lung Lau is a private property. Unauthorized exploitation of its elevators would deprive the access rights of its residents, including elderly person, children and wheelchair users. Any resident found trespassing Kwun Lung Lau will face IMMEDIATE SUSPENSION. Be considerate to our neighbors. 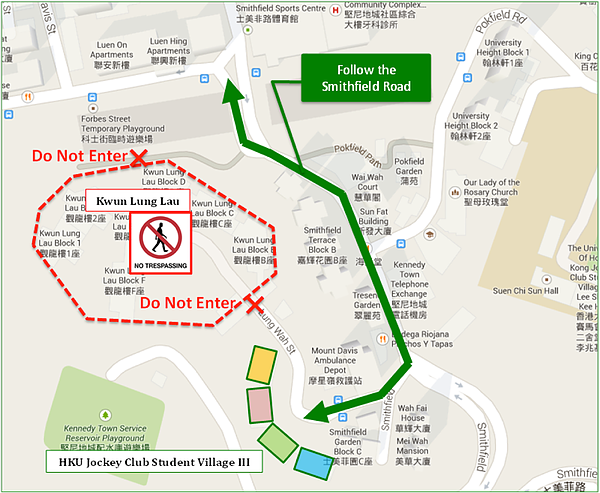 Keep your noise down and use only the Smithfield Road to access Kennedy Town and the MTR station. Only use Smithfield Road (GREEN LINE) to access Kennedy Town.